James Phillips (Dream Cycling) shared a successful breakaway with Tavis Walker (VC Walcot) whilst Illi Gardner (Veloflow) pipped Lauren Johnston in a tight two up sprint. 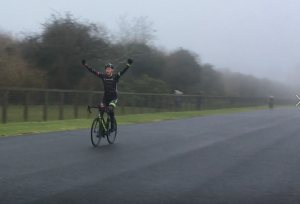 Both Charlie Revell (Team Tor 2000 Kalas) and Johnston had been defending unbeaten records going into a wet and wintery round 5, but two series debutants made the most of the conditions and ended up taking the win on the day. They still both sit in strong positions overall, with Johnston extending her lead over second placed Jenny Bolsom (Bikechain-Ricci) to fifty points and Revell holding onto top spot by five points in the men’s competition ahead of John Russell (Bristol RC). It took a long time for a breakaway to get established in the men’s 2/3 race, with many small groups trying to get away in the early laps. The main favourites were vigilant however and whilst the pace was kept high no moves got far up the road, with Revell at the forefront bringing back dangerous moves featuring first Walker and Josh Griffiths (Bristol South CC) and then Phillips alongside his overall rival Russell. However, once a strong group of eleven riders forced its way clear after twenty minutes the alarm bells started ringing in the bunch. As this group was brought to heel, Walker immediately counter attacked and was joined one lap later by Phillips. Russell and Andrew Kirby (University of Bristol) went to bridge but were unable to make the junction, and once they were back in the fold the bunch eased off and gave the escapees a gap. With the mist descending, the pair built a substantial lead but the results was far from certain with the bunch looming in the distance. As the race entered the final two laps, the pair had 20s advantage and Phillips decided that this was secure enough for him to attack off Walker’s wheel in an attempt to solo to the line. Walker didn’t respond immediately but persevered with his task, holding the gap to Phillips at only five seconds into the final lap as the bunch began to charge into the sprint. In the end the gaps held with Phillips crossing the line just ahead of Walker who managed to hold off the bunch kick which was taken ahead of Russell and Revell by Corey Bale (Cycle Team OnForm). 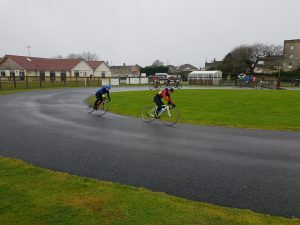 The men’s 4th cat race experienced the worst of the weather, and this affect how the race panned out, with the bunch strung out on the wet corners. This stretched the bunch to breaking point straight away, with a steady stream of groups falling off the back of the leaders. In the end there were twelve riders left in contention, and with all the riders biding their time in search of a top ten finish having made the selection, a bunch sprint was inevitable. No-one played it cooler than University of Bath’s Ed Gray, who had been in the top five twice already this series. He had been active in search of those results in previous rounds but was notably resting near the back of the group for a large part of the race once the twelve riders were away. He put those fresh legs to good effect with half a lap to go as he sprang clear of the group with a surprise move and held his slender lead all the way to the line. Steve Brown (Gloucester City CC) and Seb Barnaert led home the rest of the bunch behind Gray to lock out the podium. The women’s series is turning into a close battle behind series leader Johnson, and with five of the top six overall racing this week it was shaping up to be a decisive round. The returning Rebekah Nash (University of Bristol CC) kept the early pace high but it was a solo move by Gardner which really put the cat amongst the pigeons with first Molly Hodges (Avid Sport) and Charlotte Berry (Performance Cycles), along with Johnston chasing down the leader. Hodges paid for her chase and fell back to Bolsom, but once Garnder was caught it was Johnston who went for the next move. She was immediately covered by Gardner and the pair were away. The gap was held by the chasers at only three seconds for two laps until finally the elastic broke and the front two were able to build a substantial gap. Johnston has been dominant all series and Gardner had looked strong all race so it was anyone’s guess to who would take the win. Johnston led out the sprint, but Garnder was able to jump off her wheel in the final 100m to take the win by half a bike length. Berry showed her excellent sprint to take third from Nash, with Maria Powell (Radeon-Cyclology RT) finishing ahead of Bolsom who beat Hodges in another tight sprint. The women’s 4th cat race saw some new faces to the fore, now that riders such as Nash and Johnston have moved up to 3rd cat, with the group all staying together for a bunch sprint. Stephie Prince (Cotswold Veldrijden) had looked strong in the group throughout, and confirmed this by taking the final sprint, two bike lengths clear of Aimee Parsons (Avid Sport). Olive Holliday (Somer Valley CC) marked her first ever race with a third place finish with the rest of the group tightly packed behind. Prince’s win takes her up into the top ten overall, and so will be looking up at the riders ahead of her to try and climb further up the standings.